Texas Almanac (1857). Courtesy of the Texas Almanac. Image available on the Internet and included in accordance with Title 17 U.S.C. Section 107. TEXAS ALMANAC. The first edition of the Texas Almanac was published by the News in Galveston in January 1857, only twelve years after Texas became the twenty-eighth state to enter the Union. The idea to publish an annual almanac to attract immigrants to Texas and inform residents about their state was conceived in 1856 by David Richardson, a native of England who had been hired to work for the News a few years earlier by its owner, Willard Richardson. The two Richardsons, who were not related, eventually became partners in both the newspaper and the Texas Almanac. David Richardson, who worked as a traveling agent for the News, was credited with boosting the newspaper’s circulation and advertising income, skills he applied to the Almanac. It is estimated that the Almanac’s first five editions sold as many as 100,000 copies. The Texas Almanac’s earliest editions focused on the land, agriculture, economics, statistical information, state laws, state and county government, population, and history of Texas. They included many first-person accounts of the Texas Revolution, the Republic of Texas, and the early days of statehood, as well as biographies of early Texas leaders. Each edition included an astronomical calendar, a feature that continues to the present day. Some of the first editions also contained illustrations, such as depictions of the state Capitol and portraits of notable Texans, as well as illustrated advertisements. Advertisements during this era included services, such as hotels, shippers, printers, and insurance companies; and goods, such as stoves, plows, cotton gins, carriages, tonics, tools, housewares, garden seed, and eyeglasses. Texas Almanac 1860 Press Release. Courtesy of the Dallas Daily Herald, October 24, 1860. Image available on the Internet and included in accordance with Title 17 U.S.C. Section 107. An edition was published each year through 1873, except for 1866, totaling sixteen annual editions. Twelve of these editions ranged from 205 pages in 1858 to 362 pages in 1867. Four editions during the Civil War, from 1862 to 1865, were smaller and ranged from fifty to sixty-eight pages. Editions for the years 1857 to 1861 were published in Galveston, the first two by Richardson and Company and the latter three by Willard and David Richardson. Because Galveston was one of the Gulf Coast ports blockaded by the Union Navy and there was constant threat of armed conflict during the war, Willard Richardson wanted to suspend publication of the Almanac. But David Richardson persevered and, according to the preface, published the 1862 edition in Houston, although much of the work probably had been done in Galveston before evacuation of that city by Confederate forces. The last three Civil War editions, 1863 through 1865, were published in Austin, during which time the two Richardsons had a falling out over ownership of the Almanac’s Austin office. During his time in Austin, David Richardson also published the triweekly Texas Almanac Extra from October 14, 1862, to June 6, 1863. Despite the name, it was a newspaper, totaling 105 issues. This total included two broadsides issued on September 17 and 18, prior to the first regular issue. There also were eighteen supplements, most of which were issued during the session of the Texas legislature early in 1863. Alfred H. Belo. Courtesy of the North Carolina Museum of History and NCpedia. Image available on the Internet and included in accordance with Title 17 U.S.C. Section 107. By 1866 David and Willard had reconciled, and post–Civil War publication of the Texas Almanac was resumed in Galveston in 1867 by W. Richardson and Company. With the 1869 edition, the publication’s name was changed to The Texas Almanac and Emigrant’s Guide to Texas, reflecting the state’s need to attract settlers. From 1870 through 1872, the Almanac’s publisher was listed simply as Richardson and Company, and by that time, David Richardson had settled in New York City. From there, he served as the northern agent for the Almanac, the News, and other Texas business interests until his death in 1871. The Texas Almanac For 1873 bore the imprint of Richardson, Belo and Company, the only early edition to carry the name of Col. Alfred H. Belo, who became principal owner of the Galveston News after Willard Richardson’s death in 1875. Dallas Morning News (1885). Courtesy of the Dallas Morning News. Image available on the Internet and included in accordance with Title 17 U.S.C. Section 107. With Willard Richardson’s death, the Texas Almanac ceased publication for a time. 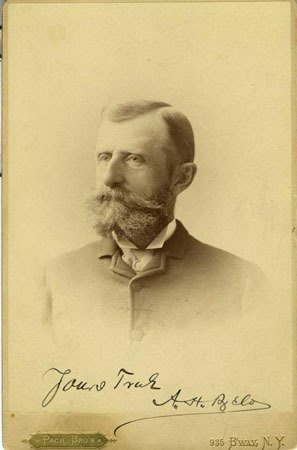 In 1885 the Galveston News spun off the Dallas Morning News as a North Texas satellite publication, and George Bannerman Dealey was sent from Galveston to Dallas to establish the Dallas paper. Dealey thought the Texas Almanac would be a way to encourage the economic development of the state, and in 1904 the Dallas Morning News resumed publication of the Almanac. Just three years earlier, the Spindletop oilfield had been discovered near Beaumont and boosted Texas into the petroleum and industrial age. To reflect this new economic reality, the name was changed to Texas Almanac and State Industrial Guide. The 1904 edition was the first to include photographs, which depicted Texans at work, landmarks, and vast landscapes. Following another hiatus, the Almanac resumed publication with editions in 1910, 1911, 1912, and 1914, some of which introduced hand-drawn state maps illustrating geology, geography, horticulture, and precipitation. Another gap in the series ensued with the outbreak of World War I.
Texas Almanac (1936). Courtesy of the Portal to Texas History. Image available on the Internet and included in accordance with Title 17 U.S.C. Section 107. The present series was begun in 1925 by the Dallas Morning News, with annual editions through 1929, when the effects of the Great Depression prompted a change to a biennial schedule. This schedule has been maintained to the present day, with these exceptions: the Almanac that should have been issued for 1935–1936 was instead published in 1936 in recognition of the Texas Centennial; a 112-page supplement to the 1936 edition was issued in 1937; the next edition of the Almanac came out in 1939, which was the last edition to bear a single year’s designation. Beginning with the 1941–1942 edition, all Almanacs have carried a two-year designation. This edition also was the first to include a detailed county map with each of the 254 county articles. By 1950 the Texas Almanac had become a reference book on geography, natural resources, industry, commerce, history, government, population, recreation, and other subjects relating to the political, civic, and economic development of Texas. The Texas Almanac 2012–2013 was the first edition to be issued as an ebook, in addition to the print edition. Reprint of the 1857 Texas Almanac. Image available on the Internet and included in accordance with Title 17 U.S.C. Section 107. There have been five special editions of the Texas Almanac: the 100th anniversary of the Almanac (1956–1957); the George Bannerman Dealey memorial edition (1958–1959); the 125th anniversary of the founding of A.H. Belo Corporation (1966–1967); the Texas Sesquicentennial edition (1986–1987), celebrating the 150th anniversary of the founding of the Republic of Texas; and the Almanac’s Sesquicentennial Edition (2006–2007). Two facsimile editions of the Texas Almanac For 1857 have been produced. The first was published in 1966 by the Dallas Morning News, and another was issued in 1986 by Glen’s Sporting Goods of Irving, Texas. Texas State Historical Association (TSHA) Logo. Courtesy of the Texas State Historical Association. Image available on the Internet and included in accordance with Title 17 U.S.C. Section 107. On May 5, 2008, The Dallas Morning News, Inc., donated the Texas Almanac to the Texas State Historical Association (TSHA), a non-profit association founded in 1897. TSHA is regarded as one of the nation’s most dynamic regional historical organizations, which also publishes the Southwestern Historical Quarterly, more than 100 books in print, and the internationally-known Handbook of Texas Online. The donation included Texas Almanac inventory, work in progress, its trademark, its URL, archives, and other assets. The Almanac website was launched around 2000 and continued to expand its content in the 2010s. The site contains features and information in addition to those in the print edition. It also contains an archive of all Texas Almanacs from 1857 through the 2006–2007 edition, which are available through the Portal to Texas History, a digital Texas history interface maintained by the University of North Texas in Denton. Texas Almanac (2016-2017). Courtesy of the Texas Almanac. Image available on the Internet and included in accordance with Title 17 U.S.C. Section 107. The longest-serving Texas Almanac editor was Stuart Malcolm McGregor, who edited 20 editions from 1925 until his retirement in 1961; the 1961–1962 edition was dedicated to him by the publishers. The editorial policies and format that McGregor established have continued in subsequent editions. Beginning with the Texas Almanac 1943–1944, Ruth Harris served as associate editor for twenty-one editions, the most of any Almanac staff member. When she retired, the 1986–1987 edition was dedicated to her. In all, Harris had worked for the Dallas Morning News for forty-nine years. In 1961 Walter B. Moore became editor of the Almanac. Fred R. Pass succeeded him in June 1973. Upon Pass’s resignation in 1981, Michael T. Kingston became editor and served until his death in 1994. At that time, associate editor Mary G. Ramos (known then as Mary G. Crawford) was named editor, and Robert Plocheck was named associate editor. In 2002 Ramos retired and was succeeded by Elizabeth Cruce Alvarez. In 2017 Catherine Rosie Hatch became the Texas Almanac’s first managing editor. Handbook of Texas Online, Mary G. Ramos and Elizabeth Cruce Alvarez, "TEXAS ALMANAC," accessed April 25, 2019, http://www.tshaonline.org/handbook/online/articles/eft01.